In California’s Mojave Desert last year, an American man wearing a helmet and body armour stood in front of a line of rifle-toting Emirati troops who were in the United States for military training. He did not misspeak: Gen Toumajan, a former lieutenant colonel in the US Army, is the commanding officer of the United Arab Emirates’ military helicopter branch. He wears the UAE’s uniform, gives orders to Emirati troops and – when he meets with American counterparts – is identified as a general of a foreign force. The UAE’s futuristic cities and booming economy were built on foreign know-how and labour funded by petrodollars – and its military is no different. At war in Yemen – and with aspirations of becoming a dominant land, air and sea power in the Middle East – the UAE is leaning heavily on foreign expertise to transform and guide its military. From commanders like Toumajan to mercenaries and trainers, foreigners have been central to the rise of the UAE’s military. “It seems to me that it is the way that the UAE is using, integrating and learning from foreigners that have been probably – if we had to choose one – it has been the central enabling factor for Emirati military capability,” said David Roberts, an assistant professor at King’s College London and an expert on Gulf affairs. Toumajan is not the only foreign commander in the UAE’s armed forces. Australian Mike Hindmarsh heads the UAE’s Presidential Guard, which is considered to be among the most elite fighting forces in the Arab world today and is active in Yemen. The role Toumajan and Hindmarsh play is not exactly clear. The Presidential Guard is said to lead the UAE’s deployment in Yemen and Hindmarsh is believed to answer directly to Abu Dhabi’s crown prince Mohammed bin Zayed. But Toumajan has disputed his role in the UAE’s military, telling Buzzfeed earlier this year that he did not have forces under his command in Yemen and that he had not sworn allegiance to the UAE. He also called himself a “civilian contractor” despite holding rank in the UAE’s military, acting as a representative of the UAE and being regarded as a foreign commander by US forces. Roberts, the UK-based Gulf expert, said the commanders are more than figureheads and likely play a key role. “I presume they have been influential in the planning process working alongside senior Emiratis,” he said. Other western officers wear the UAE’s uniform and hold rank as well, but they appear to be confined to training roles. An Emirati company called Knowledge Point employs a large number of former American officers tasked with training and advising Emirati forces. While some of their work is as mundane as writing military textbooks, one employee lists himself as a “senior advisor to the Commander of Land Forces”. In online resumes, other employees write that they are specifically readying Emirati troops for combat in Yemen. Sean McFate, a former mercenary who now studies and writes about private military contractors, said these kinds of gigs are attractive for retired US officers. Becca Wasser, a policy analyst at the Rand Corporation who specialises in US defence and foreign policies in the Middle East, said Emirati forces have benefited from training alongside the US and French forces, as well as their deployments to Afghanistan. But she added that the UAE’s military depends on foreigners it contracts to keep it up and running. The UAE military’s reliance on foreigners is not exactly new. Back in 2010, Blackwater founder Erik Prince was tasked with putting together a mercenary army in the UAE that would confront any potential worker or pro-democracy uprisings. Before he joined the Trump administration, US Defence Secretary General Jim Mattis received permission from the US Marine Corps to serve as a military advisor to the UAE in 2015. The UAE has also been accused of sending hundreds of Latin American mercenaries – members of the hired gun army Prince founded – to fight in Yemen. While Emirati troops have deployed to Yemen and played a key role, they have outsourced much of the fighting to their local anti-Houthi allies, limiting their own casualties. McFate, the former mercenary, said the policy lowers the barriers of entry to war. “Being able to outsource war seems to promise more war in the future; that’s what’s so dangerous about it,” he said. 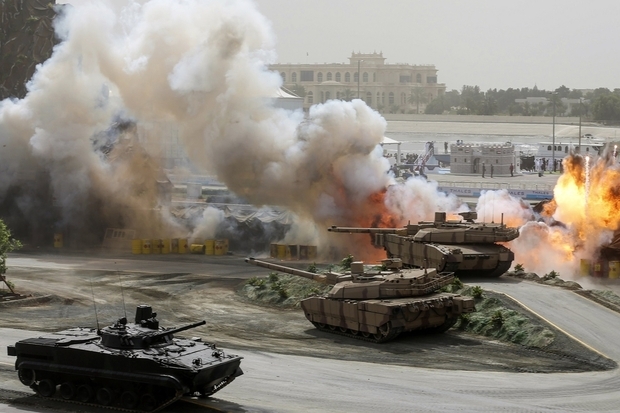 Emirati military ambitions only appear to be growing. The UAE is at war in Yemen. The country reportedly considered using military action against Qatar. In East Africa, it has built a base in Eritrea and is planning to establish a base in Somaliland, a semi-autonomous region in Somalia. To support its military ambitions, the UAE introduced a mandatory military service of one year for men between the ages of 18 and 30 in 2014. And on Sunday, the UAE extended that military service period to sixteen months. From bombing civilian targets to torturing prisoners in detention centres, the UAE stands accused of a number of war crimes as its war in Yemen enters its fourth year. So what happens if troops serving under a foreign commander commit a war crime? Rebecca Hamilton, an assistant professor of law at American University in Washington, DC, said it’s hard to prosecute war crimes, especially when the role of a commanding officer is opaque. It also comes down to where the foreign commander is from. A foreign commander from the United Kingdom or Australia could potentially be tried at the International Criminal Court, but as the US is not a party to the statute that established the court, that is not an option for Americans. Since 1996, the US has had the War Crimes Act, which allows for the prosecution of any “grave breach” of the Geneva Conventions. However, the act has never been used. Hamilton said it would require strong evidence – as well as adequate political will – to be put it into action. While Americans who have read the fine print on their passport might remember a line about how serving in a foreign military could result in a loss of American citizenship, the reality is much more complicated. By law, a US citizen could lose their nationality if they voluntarily – and with the intention to – join a foreign military that is engaged in hostilities with the US or if they serve as an officer in any foreign military. The Emoluments Clause of the US Constitution prohibits former military officers from seeking employment with foreign powers, except in cases where Congressional consent is obtained. So as long as Toumajan does not intend to give up his US citizenship and has received permission to work for the Emiratis, he is in the clear. With foreign commanders continuing to serve a military that is accused of war crimes and facing no repercussions, others could be tempted to follow their path. “In general, whenever you have a law on the books that people are seeing is not being enforced in practice, then you don’t have much deterrence going on,” said Hamilton, the assistant law professor.